The Paro Dzong is bigger than you first think. As I wrote before, it houses an administration as well as a monastic part. We walked back there in the afternoon during the Tsechu, to take a closer look. 1974 Bhutan opened up to the world, and some years ago they invited the great leaders of the outside world, to show their winning concept. Not all leaders came, of course, but those who listened must have been impressed. This tiny Himalayan nation, surrounded by much larger countries with massive populations and economies – seem to stand tall in their beliefs and try to follow the road chosen. 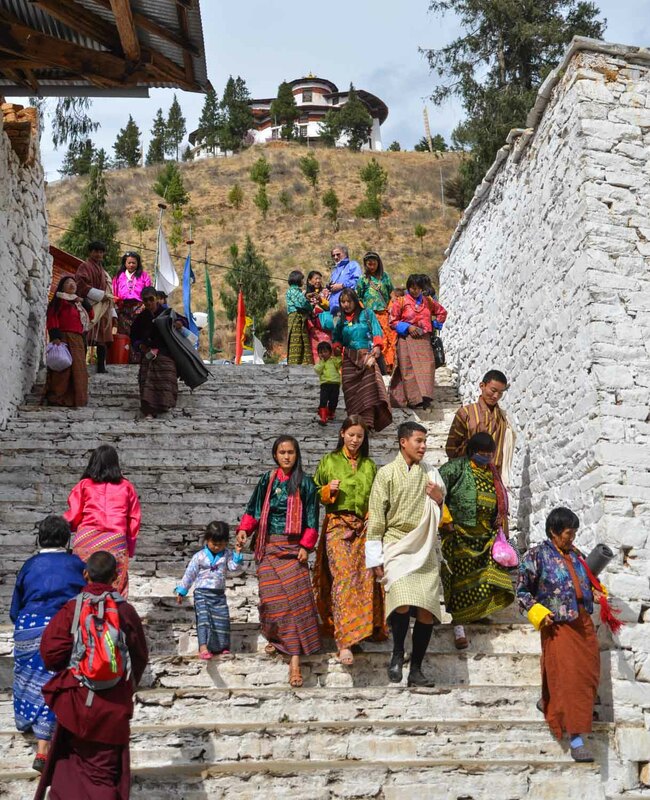 Bhutan combines Gross National Happiness (explained further down) with democracy and Buddhism. A concept they try to convey to the world as well. In fact, the Resolution of Happiness was adopted by the UN’s National Assembly in 2011, leading to World Happiness Day now being celebrated across the globe annually on March 20. Dogs, dogs everywhere, but sometimes a sunny cat! The Watch Tower used to house the National Museum, but the tower was damaged in an earthquake, so the museum was now set up in a building nearby. Going down again we passed some sellers. 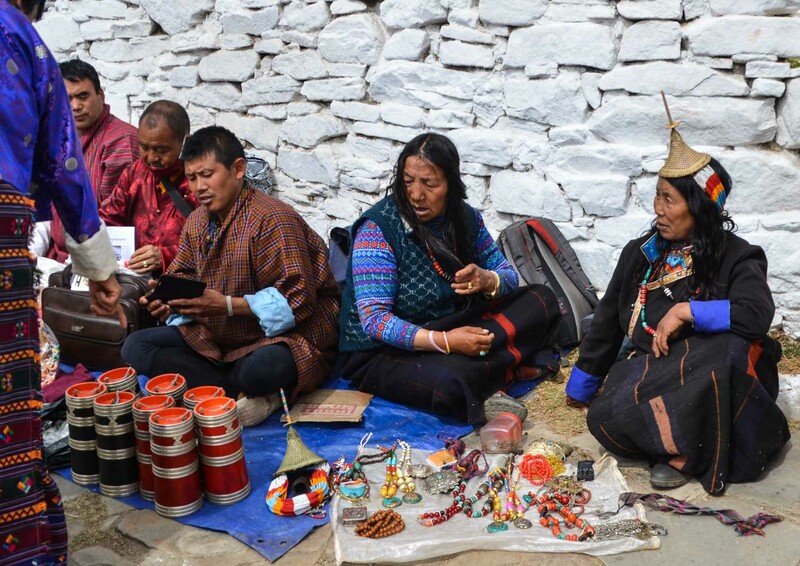 Their hats and clothes tell about their origin – they are Layaps, living in the north western parts of Bhutan, at almost 4000 meters. Until the 1980s the Layaps lived in complete isolation from the rest of the country. A rapidly growing economy has resulted in increased consumerism – leading to imports mostly from India. The government decided to place a ban on many imports, including cars, but it remains to be seen if globalization and everything in its wake can be sufficiently kept at bay. Let us hope so. The King and the Government seem very determined. Modernity is coming though. 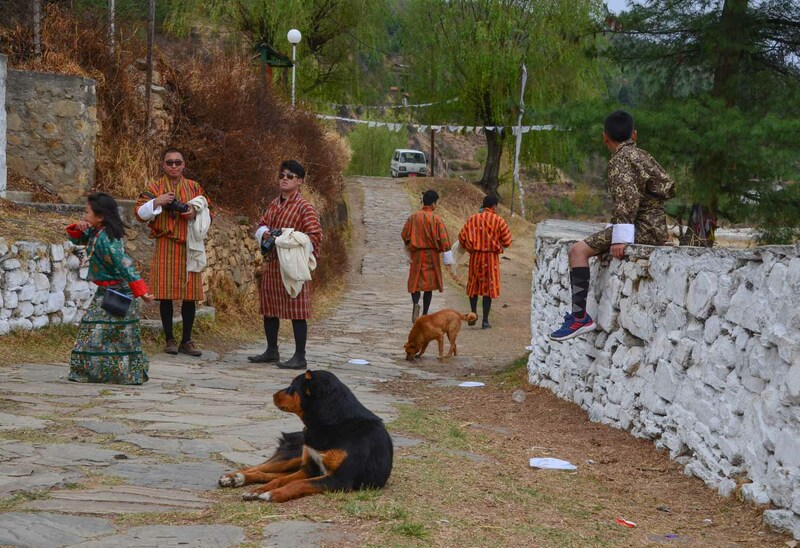 Cell phones and heavy camera equipment already in Paro – and dogs on leash in Thimpu. But – Thimpu is the only capital in the world without traffic lights. There is still a policeman in a box, in the middle of the street, gracefully waving the traffic in the right direction. According to our local guide, Rinzen, there is a validation before a decision is taken, and after the implementation of it. If people are not getting/did not get happier out of this – the concept will be dropped. 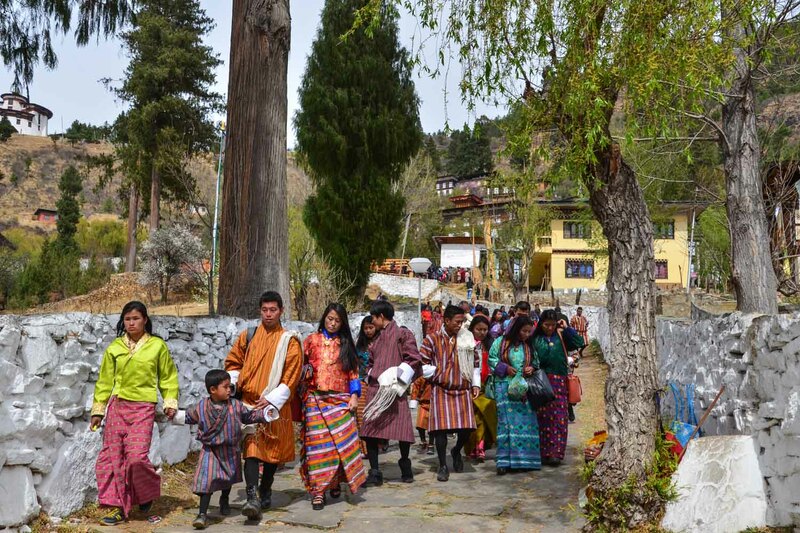 Bhutan is the world’s only carbon-negative country. Just Imagine. And, this is true. Thank you for the photos, I had been there long back with my parents. Beautiful photos and information. It is one of the place in my wish list. Please go – you will not regret it. It was nice to return to this magical land through your wonderful posts. I have great regards for this country and its people. I am glad! I admire and love them immensely. Thank you – glad you enjoyed them! Hi, Ann-Christine. I have wanted to go to Bhutan for so long. What a wonderful place! I didn’t know about the GNH index. How great is that? Now, I really have to go there! Great post and photos. Thank you, Patti – and you will not regret your visit to this Himalayan Shangri-La. En mycket läsvärd och även tänkvärd inblick i levnadssätt, traditioner, arkitektur och gatuliv. Vardagen, så vitt skild från hur vi lever idag. Skickligt presenterat i både ord och med dina tillhörande rader. Tack för så fin kommentar, Anita. Bhutan i mitt hjärta. A truly amazing country and I hope they can hold on to their ideals. They show a unique way of living can be achieved. But the rest of the world is too far gone into commercialism to turn back now. Yes, we are lost…but they still have the chance. Vielen Dank für diesen informativen Bericht und die tollen Aufnahmen… Klasse! It’s lovely to see a country trying to do things differently, and in a peaceful way. It is. They have my heart and hopes. It sounds like we could all learn from this little Country. We could – and should. I feel they still have the chance, being a small country, no invaders, everything pristine still and only 750 000 inhabitants. Manageable. 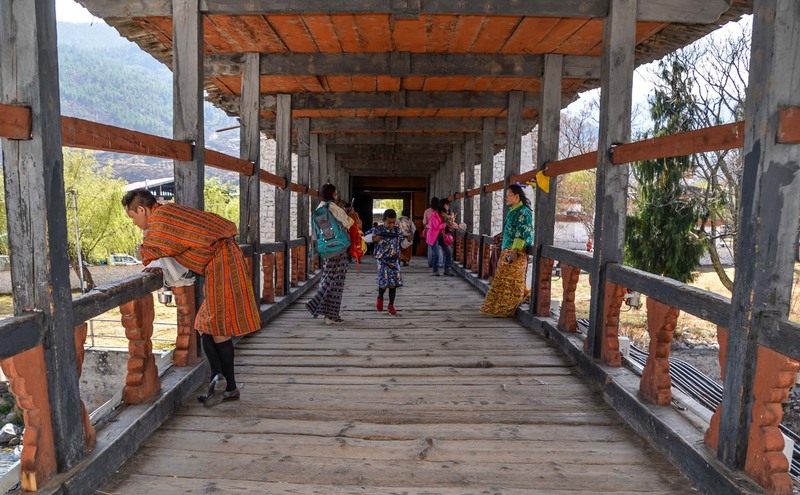 Great post Leya, I have been reading a lot about Bhutan Lately. A place of interest for sure. The last Shangri-La? Yes. Except, it is for real! Wonderful images and informative post, Ann-Christine. I didn’t know a carbon-negative country existed. Imagine, indeed.